The limited-edition Ma¬hatma Gandhi pen, priced at Rs1.1m ($23,000, €15,800, £14,400), has an 18-carat solid gold, rhodium-plated nib, engraved with Gandhi’s image, and “a saffron-coloured mandarin garnet” on the clip. 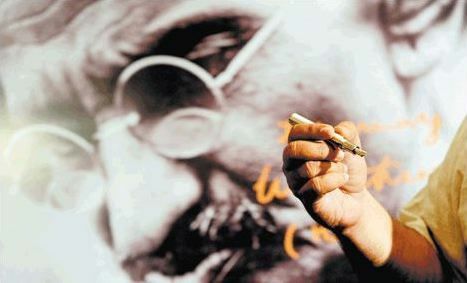 The pens were unveiled this week, before the national holiday on Gandhi’s birthday. Dilip R. Doshi, chairman of Entrack, Montblanc’s distributor in India, said the pen embodied Gandhi’s timeless philosophy of non-violence and respect for all living creatures. “We are creating a thing of simplicity and beauty that will last for centuries,” he said.